Bandikui is a city and a gram panchayat, panchayat samiti in Dausa district in the state of Rajasthan, India. Bandikui is a major railway city at the junction of Agra-Jaipur and Delhi-Jaipur railway lines in Dausa district of Rajasthan. The city is located 205 kms South of Delhi. Bandikui was preferred for the tri-junction by British Railway surveyors over Rajgarh, Alwar due to better alignment and the Bandikui railway station was established in 1874. 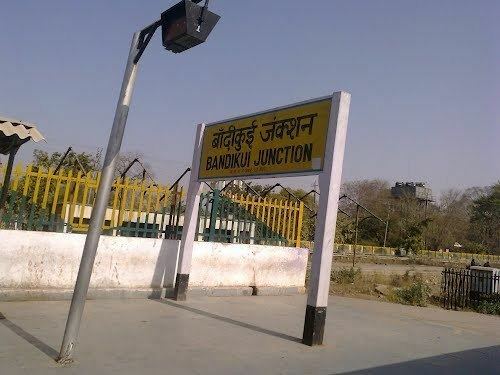 Most trains plying between Delhi and Jaipur have a halt at Bandikui such that the city remains one of the most important railway junctions in North Eastern Rajasthan. At its height there were 1000 families of Britishers living in Bandikui. Some Raj era bungalows can still be seen today. In recent times the city has attracted migration from nearby villages and its population has swelled to more than 1.7 lacs. Many individuals from Bandikui work in Delhi and keep their families in houses build in Bandikui as the city is easily accessible from Delhi. Bandikui boasts of the beautiful St Francis Roman Catholic Church, cast in stone, located near the railway station. Rajasthan Government has recently given a grant of Rs 1 Crore for the restoration of the church. St Francis school, located nearby consistently produce pupils who top various Rajasthan examinations. The city is a major agrarian center about 12 km North of the main Agra-Jaipur Highway. Abhaneri Chand Baori the deepest stepwell in India and the Harshad Mata Temple dating back to 9th cebtury AD are located at a distance of about 7 km from Bandikui. The famous Mehndipur Balaji temple is about 35 km away from Bandikui on the main Jaipur-Agra highway. The famous Rajgarh town, erstwhile capital of Alwar state, is about 25 km north of Bandikui on the main Delhi Jaipur railway line. Rajgarh boasts of the Baghraj Maharaj temple, hills, historic fort, stepwell and palaces. The town of Sikandra, famous for its sandstone works is located about 12 to the South of Bandikui at the junction of State Highway 25 and Agra-Jaipur Highway. The famous natural water spring located at the village of Jhajirampura, Baswa is about 18 kms to the North of Bandikui just off the main State Highway 25.